All the structures are made by stainless steel, which are durable and never rusty. The standard bubbler is top-press bubbler. 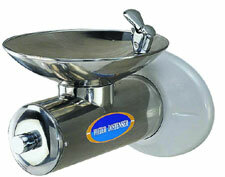 But you can choose to change to front-press bubbler (The push button of the bubbler is on the front.). CJ-315 can be connected with CJ-318 (cooling system) to offer cold water.